According to a new report, Russian authorities secretly recorded one of the Boston bombers discussing jihad with his mother, Zubeidat Tsarnaeva, in 2011 but failed to alert U.S. security agencies. U.S. officials were told for the first time this week that two calls of note were discovered when the Russian internal security service, the RSB, were bugging calls at the Tsarnaevs family home in Dagestan, according to reports. The recording picked up a “vague conversation” about jihad between either Dzhokhar or Tamerlan Tsarnaev and their mother Zubeidat Tsarnaeva, the Associated Press reported. It also picked up a phone call between Zubeidat Tsarnaeva and a man under FBI investigation living in Southern Russia. American security sources anonymously revealed the information to the news agency and said if the calls had been flagged to the FBI, the agency may have conducted a more detailed investigation into the two men. There was no evidence of a plot against America in the calls, according to the report. The news comes as the FBI attempts to defend itself against criticism that it failed to fully investigate Tamerlan Tsarnaev that year. In January, the FBI investigated and interviewed the family after Russian authorities flagged the elder bomber as a possible security threat. It is not clear why the phone calls would not have been reported to American security officers as part of that briefing and the RSB were unavailable for comment. Following their probe, the FBI concluded Tamerlan Tsarnaev did not present a threat and ceased monitoring him stating they saw no links to “terrorism activity, domestic or foreign”. Sen. Lindsay Graham (R. South Carolina) said the agency had “dropped the ball” in that probe. On Friday, the New York Times reported that the Russian government followed up their concerns over Tamerlan Tsarnaev six months later – asking the CIA for whatever information it had on him. It is not clear what prompted the Russian request but the CIA review agreed with the FBI that Tamerlan Tsarnaev posed no threat. As a precaution they placed him on a 70,000 name watch-list called the Terrorist Identities Datamart Environment (TIDE). However, there were mistakes in both the spelling of his name and in his date of birth, so his six month departure from the country in 2012 wasn’t properly identified, according to the Times. The first Russian request came in March 2011 through the FBI’s office in the United States Embassy in Moscow. In a one-page request they said Tamerlan Tsarnaev “had changed drastically since 2010” and was preparing “to join unspecified underground groups”. By June 2011 the FBI said they were satisfied he provided no threat and notified Russia. They also added Tamerlan Tsarnaev to another watch-list – the Treasury Enforcement Communications System. According to the Times, the FBI repeatedly went back to Russia to request more detail but they failed to provide any new information. Zubeidat Tsarnaeva has come under increasing scrutiny in recent days given her outspoken denial of her sons’ actions and wild accusations of a cover-up. 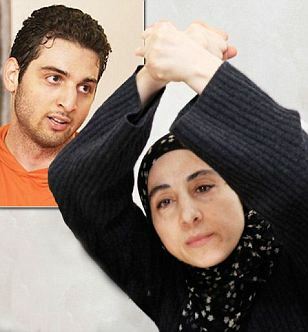 She has repeatedly said her sons were framed and even claimed blood on the streets, after the bombings, was paint. On Friday, it emerged agents now consider Zubeidat Tsarnaeva “a person of interest” in their investigation. “She [Zubeidat Tsarnaeva] is a person of interest that we’re looking at to see if she helped radicalize her son, or had contacts with other people or other terrorist groups,” Rep. Dutch Ruppersberger, a Democrat from Maryland, who serves on the House Intelligence Committee, said. Both sons appear to have had a close relationship with their mother. She was intending to travel with her husband to the U.S. last week but both delayed those plans. Zubeidat Tsarnaeva said any suggestion she has links to terrorist activity are “lies and hypocrisy”.